Minnesota is a land of 10,000 lakes and almost as many misconceptions about the size of government, growth in public revenue and expenditures, and performance of the state’s economy. Some of these mistaken beliefs are the result of an innocent misreading of the data, while others are the product of deliberate disinformation campaigns. The following is the first of two dives into some of the more common policy myths in the Gopher State. The debate over whether a state has big or small government skirts the more important question of whether citizens are getting a good return on their dollar. 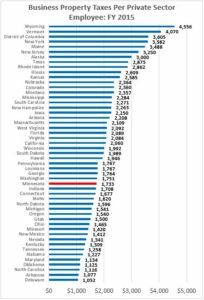 However, so long as state rankings continue to circulate in policy debates, it is worth noting that the size of government in Minnesota is fairly typical of that in other states. Some conservatives contend that Minnesota’s economy is faltering relative to the national average; they go so far as to blame this outcome on “blue state policies.” In reality, during the current business cycle—which began with the onset of the Great Recession in 2007—Minnesota has outperformed the national average in terms of job, labor force, per capita Gross Domestic Product (GDP), median income, and per capita personal income growth.† In addition, Minnesota’s 3.2% unemployment rate is nearly a full percentage point below the national average (4.1%). Economic performance in conservative Wisconsin has been far weaker than in Minnesota during the current business cycle. Job and income growth has been especially weak, as the Badger State’s labor force grew at a pace less than half the national average and real median income declined by 3.0% since 2007. A report from the right wing Center of the American Experiment complained about lackluster economic performance in Minnesota. This report examined older data extending back to 2000. 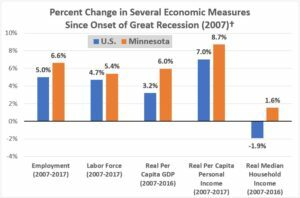 Minnesota’s economy underperformed the national average from 2000 to 2007; however, during this period Minnesota was reducing real per capita revenue and spending more than just about any other state. We leave it to conservatives to explain why the state’s economy was performing so poorly during the period when state fiscal policy was dominated by a “no new tax” agenda. Based on FY 2015 data compiled by Ernst & Young (EY) for the Council on State Taxation, Minnesota’s business taxes are two percent below the national average per dollar of private sector gross state product (GSP), eleven percent below per dollar of total state and local taxes, and seven percent below per private sector employee. In terms of the ratio of business taxes to the level of state and local tax-funded spending that benefits business, Minnesota is either slightly above or below the national average, depending on the assumptions used. Further analysis of EY data shows that Minnesota business property taxes as a percent of private sector GSP and business property taxes per private sector worker are also below the national average. Minnesota business groups typically cite so-called “business tax climate” studies to support their contention that Minnesota business taxes are high. However, as noted by economist Peter Fisher, these studies are based on arbitrarily weighted factors that penalize states that have somewhat less regressive tax systems, such as Minnesota; furthermore, Fisher notes that these business tax climate studies correlate poorly with actual measures of economic performance. According to data from annual residential homestead property tax reports (a.k.a. 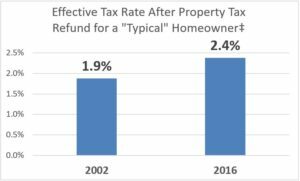 the Voss reports), the median homeowner effective tax rate (i.e., final property tax as a percent of income) has declined since 2007. This had led at least one think tank to declare that property taxes paid by the typical homeowner have declined. This conclusion—while understandable—is very likely wrong. From 2007 to 2016 (the period covered by the Voss reports), the number of homesteads in Minnesota declined, despite a six percent increase in the state’s population. This decline was almost certainly the result of the foreclosure crisis, which forced many Minnesotans from their homes. These households almost certainly had lower incomes—and as a result higher property effective tax rates—than the average homeowner. The drop in median homeowner effective tax rates is likely due primarily to the exodus of many low-income households from the pool of homeowners, not from a decline in property taxes paid by the typical homeowner. Property taxes paid by an average income homeowner living in an average value home and subject average tax rates have increased significantly since 2002, based on a 2017 North Star analysis. These findings are consistent with the practical experience of homeowners across the state. While we can’t explore all the fiscal myths that swirl around policy debates in Minnesota, we will explore four more in the second article of this series. *Claims that Minnesota is a large government state are generally based on per capita data. The problem with these claims is that high per capita income states—such as Minnesota—almost always have high per capita taxes, own-source revenue, and total spending. That is because high per capita income states typically receive less assistance from the federal government—and thus must rely more heavily on taxes and other own-source revenue than other states. 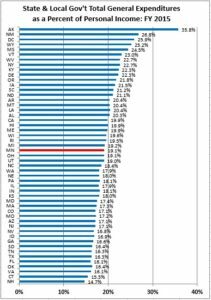 Wages in high per capita income states also tend to higher for both public and private sector workers; this tends to drive up the cost of government in these states relative to lower income states. A good way for control for the impact of per capita income on public revenues and expenditures is to examine revenues and expenditures as a percent of personal income. †The time frame examined in this graph begins with the onset of the Great Recession and extends through the most current year for which data is available. Employment and labor force data is from the U.S. Bureau of Labor Statistics’ Current Population Survey. Real per capita GDP and per capita personal income data is from the U.S. Bureau of Economic Analysis. Median household income data is from the U.S. Census Bureau’s American Community Survey. Per capita personal income and median household income data were not available in real (i.e., inflation-adjusted) dollars; in this analysis, they were converted to real dollars using the Consumer Price Index. ‡”Effective tax rate” here is defined as the property tax after subtraction of the Homeowner Property Tax Refund/Homestead Credit Refund as a percent of household income. A “typical” homeowner is defined here as an average income homeowner with one dependent residing in an average value home and subject to average statewide tax rates. The methods used to calculate these rates were described in a 2017 North Star article, except that findings here are updated to 2016; 2002 income for the typical homeowner equals the 2016 average income for owner occupied households multiplied by the ratio of average household income for all Minnesotans in 2002 to that of 2016.